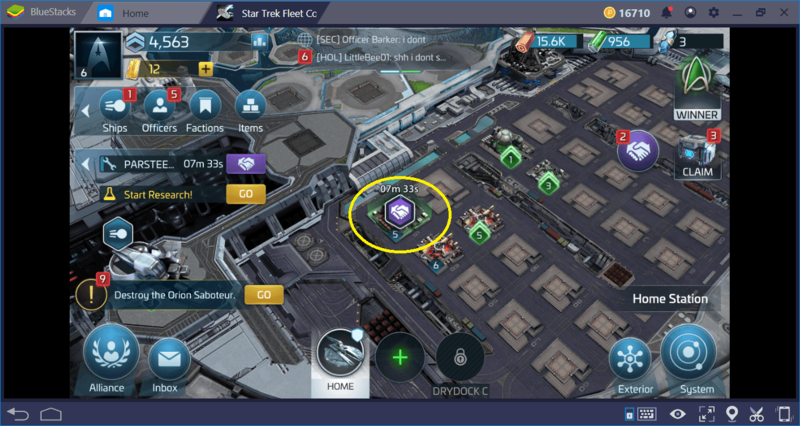 At Star Trek Fleet Command, you have to manage not only your ships but also your starbase. Every activity in the game, including shipbuilding, requires the use of a particular resource, and you get these from your base. Therefore, you need to know as much as possible about building construction and resource management. 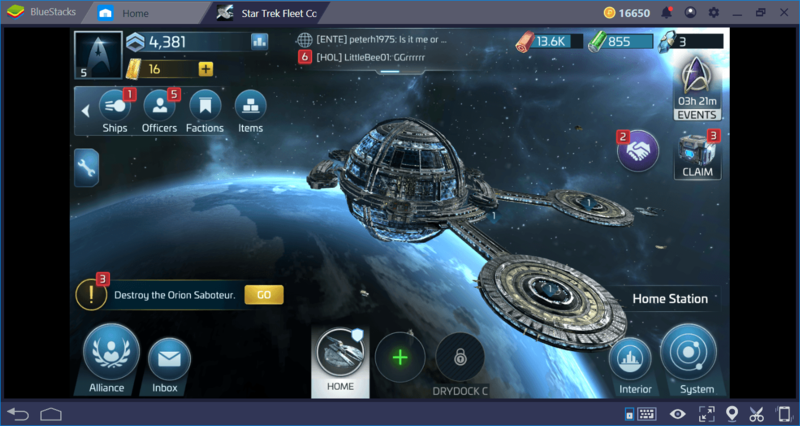 That’s why we have prepared this guide: Below, you will find detailed information and useful advice on all types of resource and building types in Star Trek Fleet Command. In Star Trek Fleet Command, you need three different resources: Parsteel, Tritanium, and Dilithium. 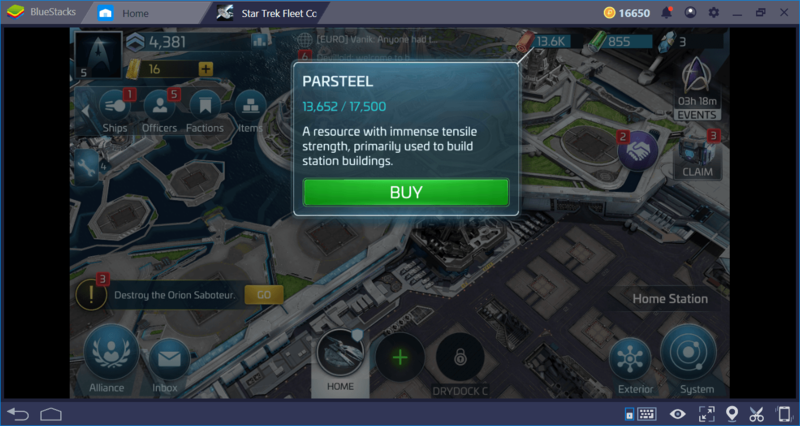 Parsteel: The main source for constructing buildings at your base. 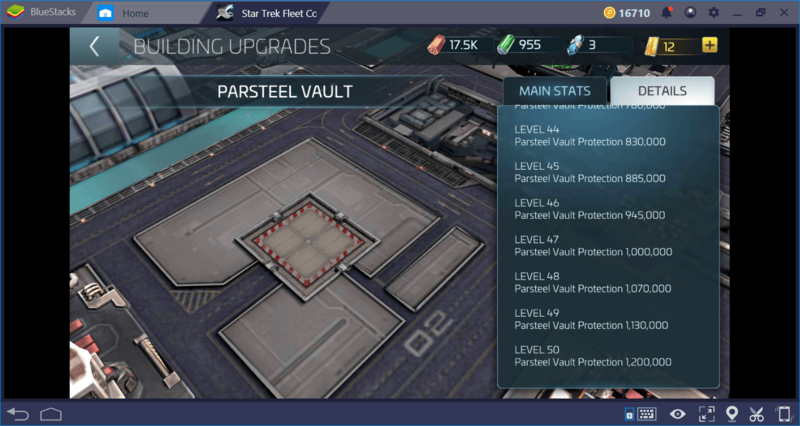 It’s easy to get and you’ll have more than enough Parsteel in almost every stage of the game. 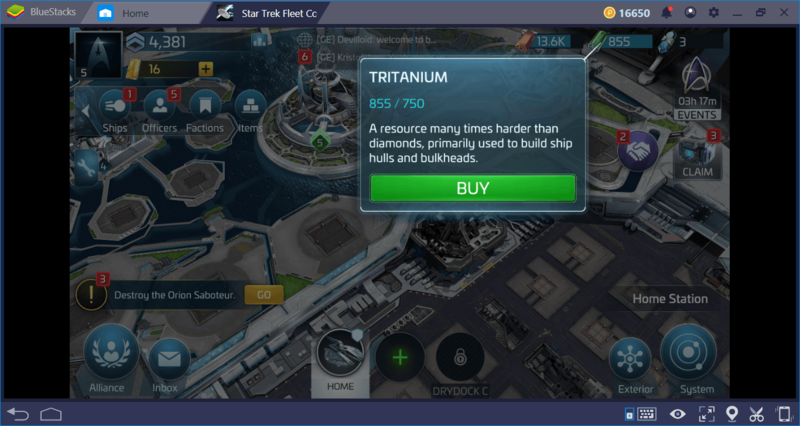 Tritanium: The main resource you will use to build ship hulls and bulkheads. Compared to Parsteel, it is more difficult to get and you will begin to feel the lack of it during the mid-game phase. 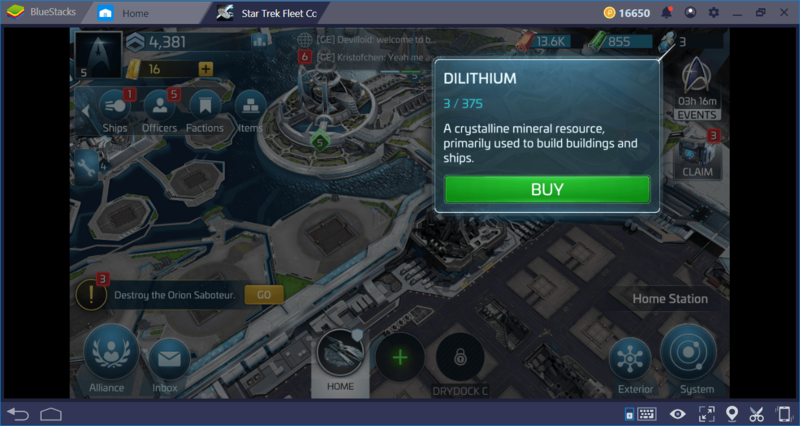 Dilithium: The rarest resource in the game, the lack of which will be quite apparent right from the start. It is extremely difficult to obtain and is used for the construction of high-level buildings and ships. Your goal is to acquire and store these resources. Star Trek Fleet Command calls the buildings used for resource production as “generators” and those for storage are called “warehouse” and “vault”. You can produce all of the three basic resources regularly by constructing generator buildings. The resources you store in vaults are protected from enemy attacks. And the warehouse provides an increase in your total resource limit. As mentioned in our Tips and Tricks guide, there is another way to get these resources: Mining. By mining the asteroids, you can obtain all three sources on a regular basis. However, this has some risks attached to it- please see our Tips and Tricks guide for more information. You can use the slots in this area to build Parsteel generators and warehouse. 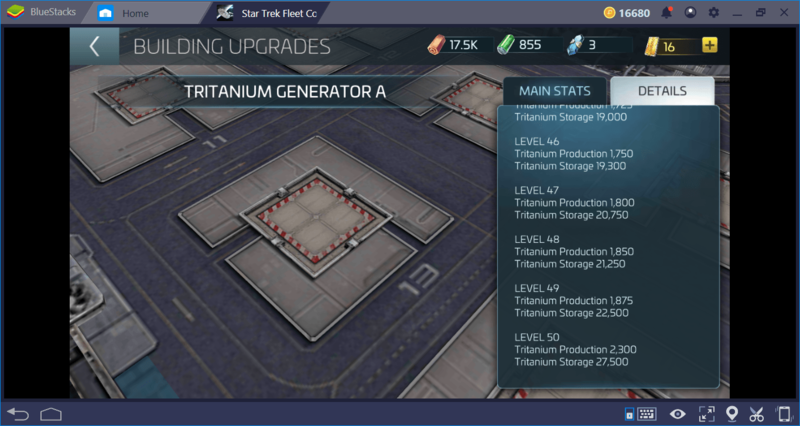 You can use the slots in this area to build Tritanium generators and warehouse. You can use the slots in this area to build Dilithium generators and warehouse. There are a total of 10 slots in each area, so you can use a total of 30 slots to produce and store resources. However, how you use the slots is predetermined. Large slots at the top of each area are reserved for warehouses – you can’t build them elsewhere. Small slots are used for generator construction. In short, you can build 8 generators and 2 warehouses for each source, these figures do not change. This makes it difficult to follow a specific strategy. As we mentioned in our review of Star Trek Fleet Command, you can only construct buildings in a predetermined order. It is not possible to follow a different tactic and, for example, dedicate resources to produce Dilithium generators first – they cannot be built before other buildings. In this context, you can see the production and storage capacity of each building in the tables below. Note that these tables contain data for level 50 buildings. 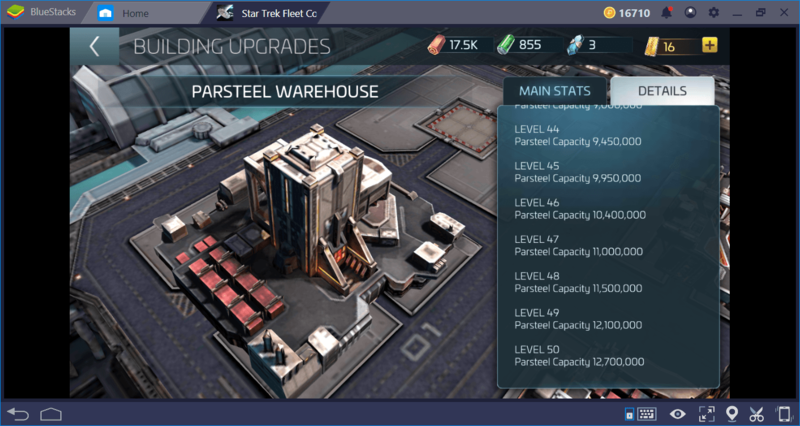 Buildings in the Star Trek Fleet Command can be upgraded to level 50. These figures show the maximum amounts you can have for each resource. Of course, if you’ve reached these numbers, you’re doing something wrong: Every resource you don’t use is wasted. 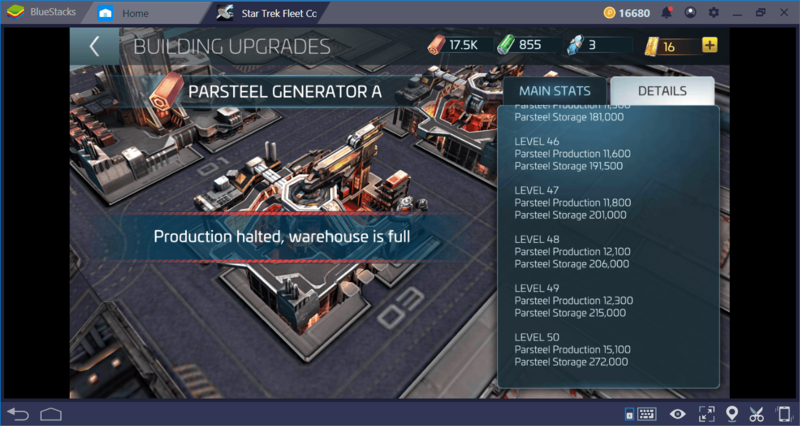 Your first goal should be to complete the construction of the Parsteel generator buildings and obtain a regular flow of resources. Only after that, you can get access to the buildings of other resources. Don’t forget to build a vault too: The resources stored here are not affected by enemy attacks. So even if your base is destroyed, you can start again with the resources in the vault. Ask For Help. If you are a member of an alliance, you can seek assistance from other members. You are allowed to send a number of help requests every day. This number increases according to the level of the alliance. Using this method, you can reduce all construction times by 5 to 10 minutes. Use A Speed Buff. You can use a buff to reduce construction times. These buffs provide acceleration at different times. Using buffs, you can complete a construction that takes hours in a matter of minutes. Speed buffs are sold for real money too, but you can also get them free of charge during the game. In this respect, the chests that you can open for free every 10 minutes are important: These buffs mostly come out of these crates. Research Construction Speed. The best way to reduce construction time is to complete the relevant research. This research consists of 15 stages, and when you complete them, you can reduce the construction time by 125%. This is a fairly high rate and doesn’t require any kind of payment. All you need is time. 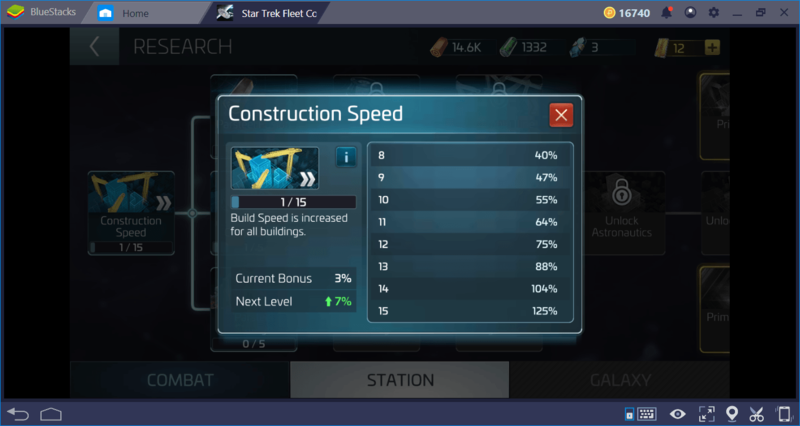 First of all, we recommend that you complete this research: The sooner you finish the stages of Construction Speed research, the more advantage you will have against other players. 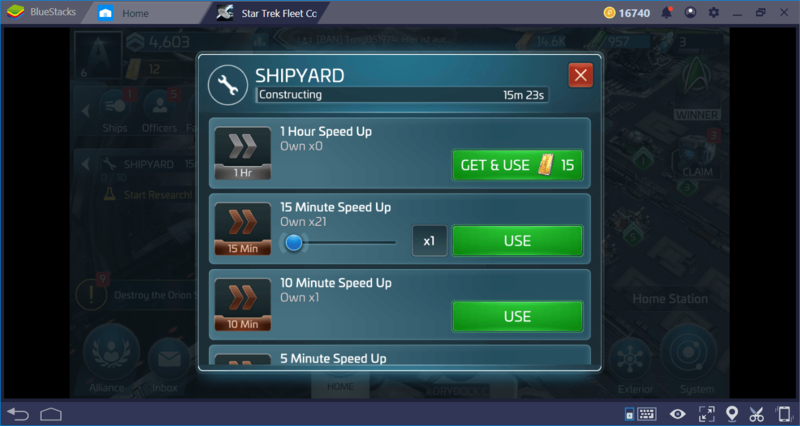 Star Trek Fleet Commander may not allow the use of strategies in building construction, but you can still gain an advantage by making the right choices in research. 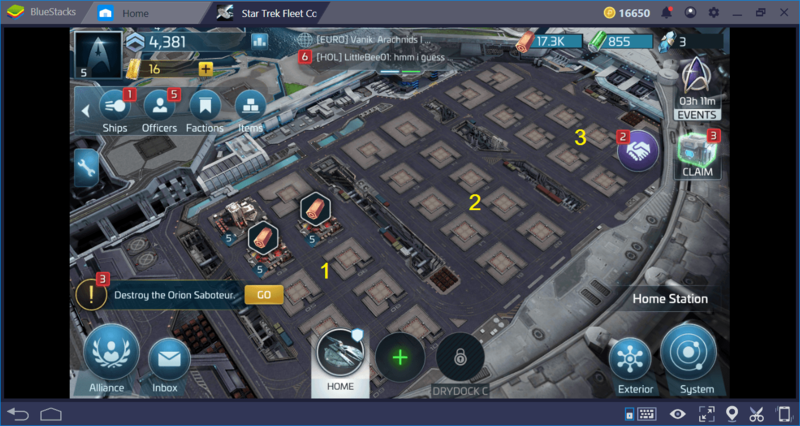 In short, Star Trek Fleet Command directs you to determine what your next building should be: This situation prevents you from using different strategies, but it gives you a very smooth gaming experience. You always know what to do and are not confused at any stage. Don’t forget to read our other guides to learn more about Star Trek Fleet Command. This is a game with highly complex mechanics and we have created guides covering all major aspects of the game to help you through it. Now, you have all the information you need about resources and building construction: It is time to conquer the galaxy. See you in space, commander!